File cabinets is a storage unit used to store office files. 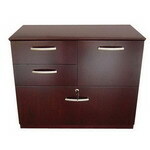 Credenzas is a piece of office furniture having a long flat top and often containing file drawers, a kneehole, and accessories for a computer. 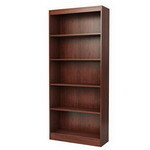 Bookcases is a storage unit used to store books.